This article is about the character. For the recurring species known as Kuribō in Japan, see Goomba. Kuribo is a Sockop that appears in the Nintendo DS game Mario & Luigi: Bowser's Inside Story. He is a reference to the Goomba's Shoe, referred to as "Kuribo's Shoe" for the original release of Super Mario Bros. 3, which Sockops generally look like. Like all Sockops it lives in Dimble Wood, and is found alongside two other Sockops, the three arguing over who gets to "chug" the unconscious Mario. 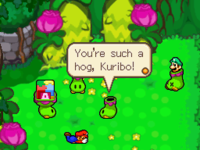 Kuribo is referred to as a "hog" among his companions, as it wants to chug Mario and even Luigi after already chugging an Attack Piece Block. However, after Mario is revived and helps Luigi out of the Sockop he is trapped in, they and the Giant Sockop Luigi was using team up to battle them. In the Japanese release of the game, Kuribo is unnamed, meaning that this particular reference was not originally in the game and was added for the international releases. In battle, Kuribo is still referred to as Sockop. ↑ Mandelin, Clyde (June 27, 2016). Q&A: What is This Mario & Luigi Sock Creature Named in Japanese?. Legends of Localization. Retrieved June 28, 2016. This page was last edited on January 28, 2019, at 01:10.